I’m not a graphologist but there is a lot of fun to be had from an amateur examination of the letter itself. In addition to containing numerous spelling and grammatical errors the letter is printed as though written by a child who has not yet learned joined up writing. The writing paper itself is childish and festooned with decorations on an origami theme. Completely fitting with the gasak buta approach of PM Lee’s government, I am reminded of that phrase: to cross your ‘T’s and dot your ‘I’s. A skill this writer has yet to master. I think we can safely assume that Kimberley is not a sophisticated woman nor highly educated. How kind of us to provide her family with work and presumably a condo with a swimming pool and the other usual facilities. Poor Lee Hsien Loong! It is a hard life being part of the natural aristocracy! We Singaporeans are an ungrateful bunch! We should appreciate that he is working full time on our behalf, well at least when he and his staff at the PMO can spare the time from checking up on what unemployed bloggers like Roy Ngerng are writing about him or when he is sequestered with his lawyers instructing them to issue defamation writs. For all his hard work and sacrifice on our behalf the Prime Minister earns peanuts, taking home a mere $2.4 million tax free while his own bureaucrats at Temasek subsidiaries like SingTel are trousering tens of millions in a good year. He is lucky that he has his wife’s compensation as head of Temasek ( probably hundreds of millions) to fall back on otherwise he really would be on the poverty line compared to the heads of MNCs, casino magnates and hedge fund managers he meets. Indeed most Singaporeans nowadays seem to have forgotten that they were living in a fishing village beside a mangrove swamp and were among the poorest people in Asia until LHL’s father came along. LKY transformed Singapore single-handedly into a gleaming metropolis and one of the richest cities in the world and did not receive a penny for his noble self-sacrifice. Singaporeans do not appreciate how lucky they are to be able to afford at least two meals a day and to be given the privilege of buying a roof over their heads from the Government. Ungrateful wretches! And increasingly Singaporean men grumble about having to do two years National Service at slave labour rates so that all the ex-pats who live in condos can feel safe here. 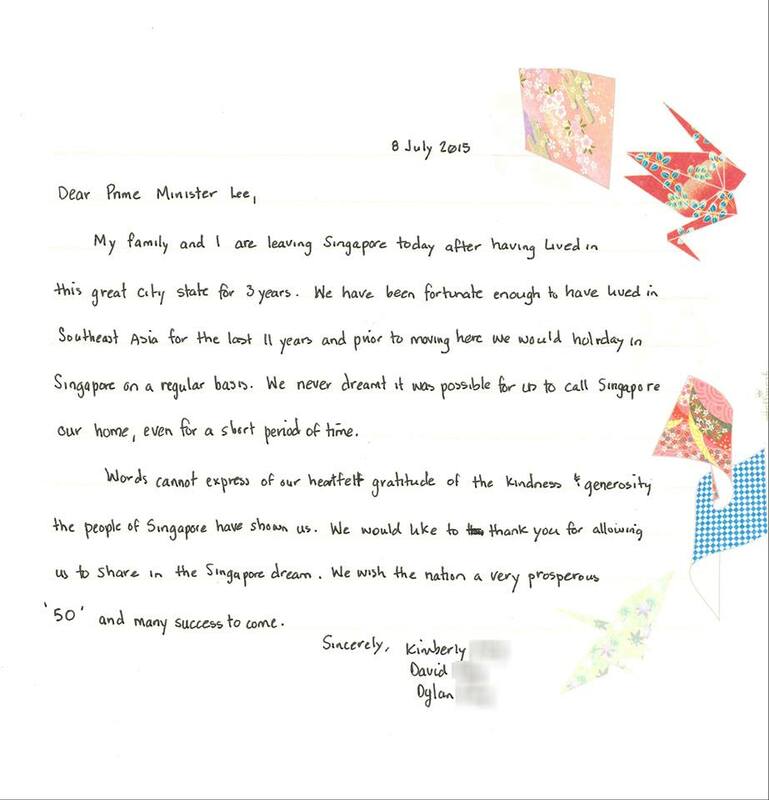 It must be a relief then to pick up a letter like this from a grateful ex-pat family praising him and saying Singapore is a wonderful place. After all, his PAP Government has been very good to them! Which other country would have welcomed people like Kimberly and her brood? They would have been stuck in third-class jobs in their home country if our government had not welcomed them with open arms. The PAP generously allowed them to take our jobs and live in luxury condos, no doubt a room each and one for the nanny, while most of us have to squeeze extended families into increasingly smaller HDB flats. They did not have to do NS yet they can walk straight in and enjoy our low tax regime. And after working in Singapore and accumulating wealth almost tax-free they can return to their home countries and enjoy all the generous welfare benefits, pensions and elder citizen help that the PAP denies Singaporeans. No wonder Lee Hsien Loong prefers the ex-pats, who write him these gushing letters, to us. To be fair it is not his fault. Nor is it the fault of the foreigners who are not good enough to make the grade in their home country but are welcomed with open arms here. Ultimately it is our fault. By our failure to stand up for our rights and show the Government that we will not be treated as second-class citizens in our own country we have allowed the Prime Minister to believe that our views do not really matter. We have allowed his father , him and no doubt his sons to perceive concrete evidence that points to them being the aristocracy in the natural order of things. It is not so surprising that the Lee family might believe that they are genetically bred to rule and the only ones fit and capable to do it but it is surprising that so many of us still believe it. Untroubled that his own citizens might throw him out at the election and convinced that he has succeeded in intimidating and hoodwinking them so well that they will never stand up for their rights, LHL has correctly identified his real constituency as being foreigners and not Singaporeans. As long as we do not stand up for our rights and teach our rulers that we are the masters and they the servants and mere caretakers of our money, this sorry state of affairs can only get worse. Well I guess you all know what to do but I somehow doubt that enough of you will do it. Hasn’t government’s stand all along been that foreigners are welcome to work here but not meddle in our politics? Even though this letter doesn’t purport to so meddle, PM’s publishing it is surely to gain by it a political point, effectively intending that those foreigners would ultimately influence Singaporean voting trend, etc. critical ones he receives from citizens which he consigns to the trash can.